I have officially fallen in love with trail running. I love the adventure and challenge that it provides. I have been struggling to be confidence in my training as I prepare for the Fall 50 October 22nd. Battling back from injury and self doubt has been a team effort. I owe my friends, family, and coach a great deal for keeping me on track and moving forward. When running on the roads irritated my injured SI joint switched gears and added more trail races into my summer plans. 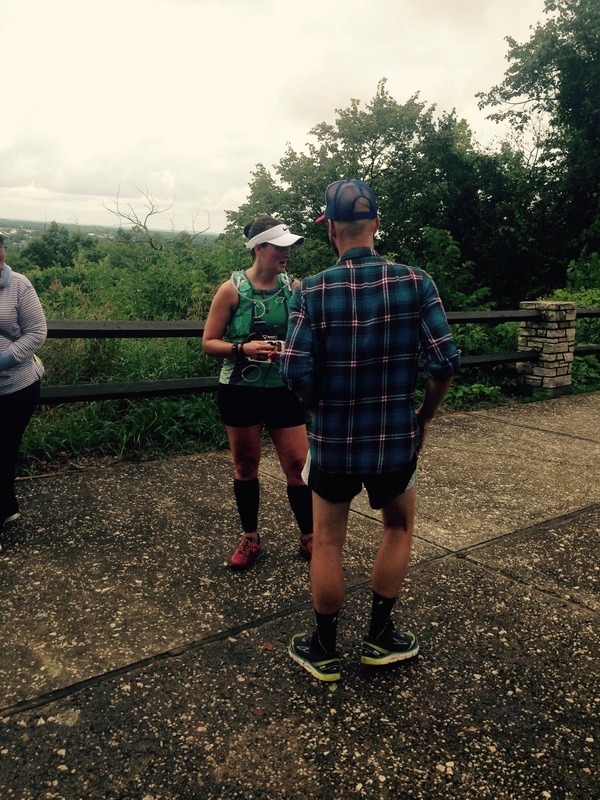 Sara, a fellow runner and friend, mentioned that she knew the race director for High Cliff Ultra in August and suggested I check it out. Sara you are my hero! Thank you a million times over for the nudge…this race delivered not only miles to my training schedule but also fed my soul. So let’s talk about the nuts and bolts of this race. After Sara mentioned the event I found more information on Facebook which took me to their website. It was well organized and informative. I was able to quickly and easily register – tops it took me 5 minutes. Less than a week later I received a hand written note and sticker from the race director thanking me for entering his event. This is the 1st time I have ever received something like this from and RD…it was a really nice, but not the only personal touch that runners were treated to at this event. After the race each runner was awarded a hand crafted medal carved out of wood, and a personal fire-roasted pizza. AMAZING! I have had my fair share of pizza throughout my lifetime, but the mushroom pizza I ordered was by far the BEST that I have had the pleasure of eating. I crave it constantly!!! In weeks leading up to the race the RD and his wonderful wife kept runners well informed about important logistics. On Wednesday an electronic newsletter was sent out to runners with information about build up runs and details about race day. I have never felt more informed or ready for a race before. I knew exactly how the aid stations would work, what would be at the stations (I was overjoyed that Tailwind was on course), weather updates, trail condition reports, maps, and drop bag instructions. Come the day of the race I was prepared. The only issue I ran into was getting to the start location the day of the race. I used the directions in the update and it brought me to a remote road. I could see the park, but could not find it. Enter Elle and her magical directions. Once I plugged into the correct info to my GPS I was able to get to the park entrance. The park ranges were super helpful with directions to the location of the race. One of the many reasons I am falling in love with trail running is the community. Once I was able to park I breathed a sigh of relief. I was cutting it close when I arrived later than I had wanted. The RD allowed Elle to grab my bib so I could prep in the parking lot and save a little time. With the large amount of races I have completed over the last 2 years I have my pre-race routine down to a science and can be ready to rock in 5 minutes flat. Elle and I got our bibs on and grabbed our drop box gear. Rain was predicted so I had put my extra items in a plastic tote to keep things dry. We ran into several other runners I have met through running events in WI and continued to head to the start. The friendships that I am building through this sport are amazing and enduring. It is like we are one big happy family and I always enjoy being able to catch up with everyone before we head out on the course. One last bathroom stop and it was go time. The boys (Shawn, Jeremy, and Ryan) headed to the front of the pack, Elle and I headed to the back. As we positioned ourselves in the crowd we met up with Dom and his friends. Dom is by far one of the coolest people I have met along my running journey. He is joy for the sport and love of life are inspiring. Any race that I get to run a few miles with him is a good race. The RD addressed the group before the race began, you could tell how much it meant to him that everyone had come out for this 1st year event. Runners may be quirky and we do crazy things, but most have a big heart and do this not for glory but for the connection with others. The High Cliff RD gets it! I adore that and cannot wait to participate in future NURUN events. Just like that we were off. Game on. Weather reports leading up to the race were not looking good. Storms were predicted…yuck! After participating in the Fall 50 relay yesterday I have come to hate running in stormy conditions. One of my fears for the solo event this year is that the conditions will be like they were last year. I remember talking to my teammates that day and commenting that there was no way I could ever run 50 miles in this type of stuff. Fast forward a year and I was in the throws of training for my 1st 50 miler, but had not shook the fear of wicked conditions. The weather that we endured in Door County had not been replicated in the months leading up to High Cliff so I was not able to work through my uncertainty. I know I am tough, but how tough…that I was not sure of. Today was my lucky day and I was about to find out if I could handle Mother Nature’s wrath. The trail was sloppy and the wind began to pick up with in our 1st few miles, but no rain (yet). Heading into the woods was liberating. The beauty of this park was unbelievable. I made it about 500 ft before I stumbled a bit and had to refocus myself. In doing so I was able to find pace and settle in. Up to this race I had been struggling to run consistently. 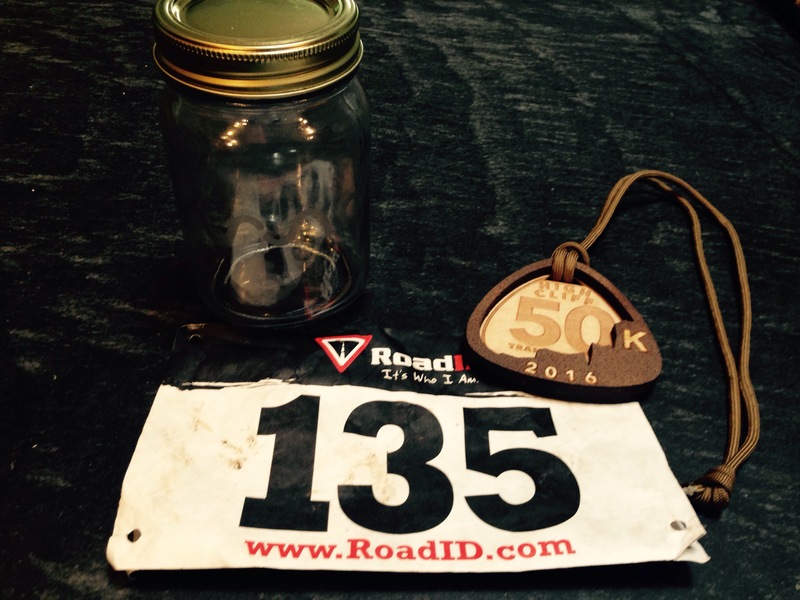 My hip/back was in constant pain and I was losing hope that I would make it to the Fall 50. Today was a test. If I could make it 31 miles I would forge ahead in my training, if not I would switch gears. I had a lot riding on this race. A few miles in the course got considerably more challenging. The climbs were no joke. At times it was impossible to run-I loved every minute of it. To run trails is to be free. You push when you can, catch your breath when you have to, and keep moving forward all while you engage in an experience that is always unique. 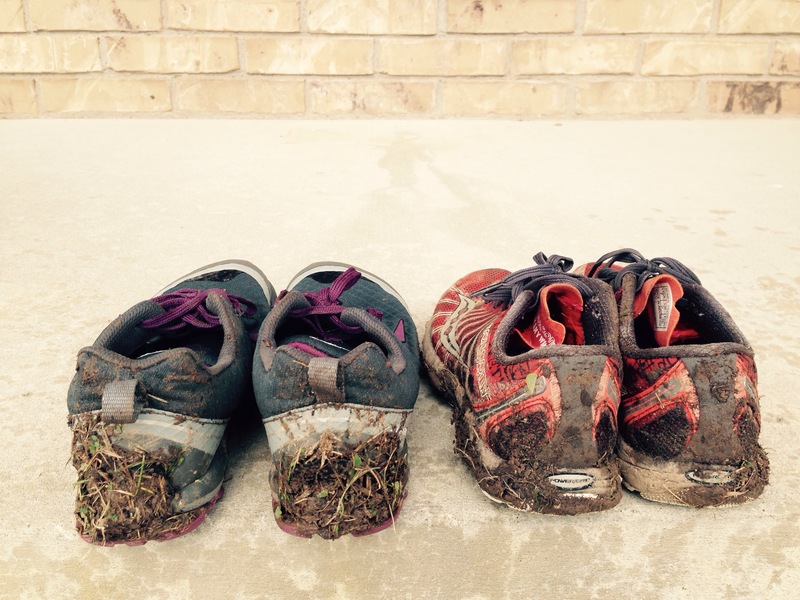 Boy am I glad that I had on my trusty Altra Superiors! These shoes have seen me through several 50k trail events this year and never let me down. There were sections of the trail that were muddy, rocky, wet, and rooty (not sure if that is a real word). Many of the rocks in sections were flat and slick due to the rain that started about 1 hour into the race. The course was marked with colored ribbons. One of the issues that I ran into was the trees that were pai nted with the same colors. I did not know if they were part of the race of the trail markings. I found out after the event that they were not part of the race and that most events will use ribbons to keep things consistent. Great info for future events! There were several volunteers that aided in keeping us on track as we went through the campground side of the park. It was neat to see individuals camping and carrying on with their weekend as we ran. 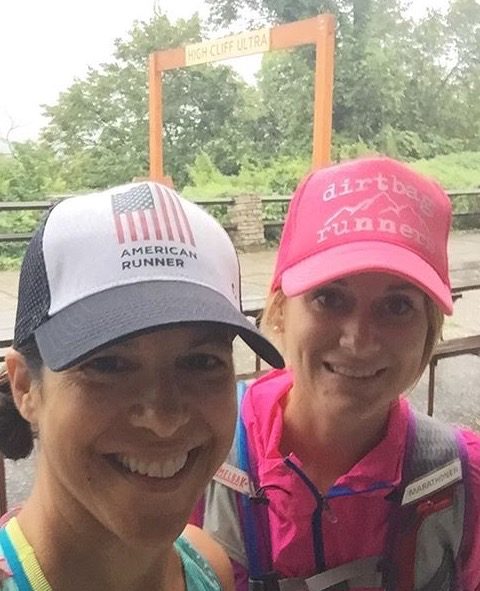 I met up with a fellow runner, Jen, who was using the race as a training run for the Northface Endurance Series 50 miler in September. We chatted and ran together for several miles. I’m glad that I had her by my side as we worked to figure out where to turn. We only had one oops…we missed the stairs to take us back down and into the park, but luckily a few other runners got us back on track. We added about a mile to our race by missing the stairs, but who is counting once you hit 31?!?!? The course was set up as a loop system. Coming from the rocky terrain we headed back to drop area and main aid station. Filling up with Tailwind we headed toward the prairie section. S everal miles in we can upon another aid station and were able to fill up. The stations varied throughout between self-serve and manned. At the 13 mile aid station I ran into Dave who helped to boost my spirit. I had no idea we were 13 miles in. That was an awesome discovery. From Dave’s aid station we had 2 miles back to base camp and the chance to start the last loop. The rain had started and it was heavy at times. I was soaked and my shoes full of water. My game plan was to swap out shoes and change my shirt at the gear drop before heading out on my 2nd loop. The aid station volunteers were super sweet at the gear drop and offered to help me change my shoes. Not many people will offer to touch a runners nasty feet. I appreciated the offer, but wanted to practice taking care of myself in preparation for the Fall 50. My goal was to be in and out in 5 minutes. 11 hours will be a challenge for me during my 50 miler and every minute will count. I will need to keep my aid station time short. There is no shyness in an ultra…off when my shirt and on went the new one. Up next shoes off and Trail Toes reapplied, new Fitsoks, and dry shoes. While I was doing this the volunteers filled up my water bottle. When I looked at my watch as I left out of the station it read 4:42 – BOOM! Now to get that down even more over the next few weeks. 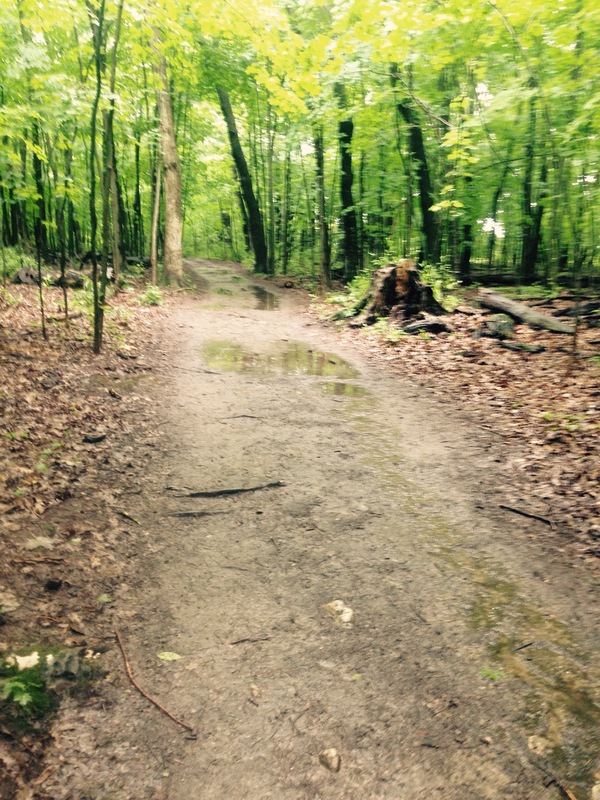 The 2nd loop was full of more rain, lots of mud, and chilly temps. Before I knew it though I had finished the secon d 15.5 mile loop and the race was over. Time to EAT! I could smell the pizza from a mile away, literally. There was a brick fire over brought in to make food for the runners and the smell had traveled onto the trail. I was met by Chris and Elle at the finish who were eating the delicious pizza I was craving. Since I was drenched I needed to 1st change then eat. I had scored a close parking spot so this was an relatively easy task. Back at the start area I ordered my pizza, grabbed some soda, and sat down with my trail friends. What an awesome adventure! While chatting and recovering I was able to see a fellow Oiselle bird finish Trisha finish her 1st ultra. She ROCKED it out and did fantastic. Man, I live a great life and am so lucky to be able to run with these amazing people! 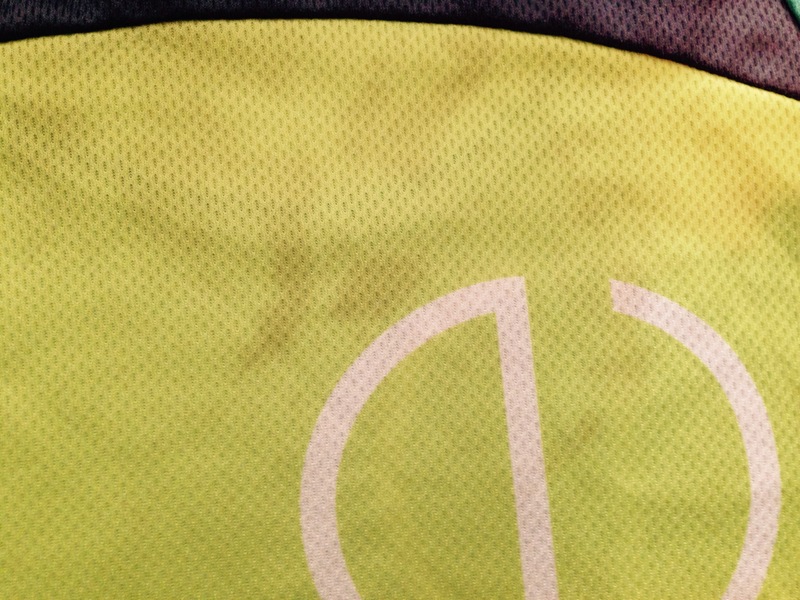 Somehow I got mud on my shoulder, not quite sure how…I stayed upright the whole race. A huge feat for me, I’m super clumsy! Shoes needed a rinse off in the front yard when I got home. There was a bit of mud on the course. A huge shout out to my buddies who busted out awesome 25k races on the same course while I was running the 50k. Kassy and Allison being the rockstars that they were go their run in, had pizza, and were done before I hit the mid-point of my 2nd loop…told you these girls were amazing! Congrats ladies on toughing it out. The trail was super sloppy after the 50k runners had gone through. Orange Mud HydraQuiver VP1 –My tried and true hydration vest. Knowing Tailwind was on course I was confident that I could refill with the fuel/fluids I like. No need to go with a big bladder system. FitSok F4 Tech Socks – My go-to sock! My feet stay dry, cool, and blister free even when I my feet get wet as they did at this race. Tailwind Nutrition – I filled my bottle 3 scoops of Tropical Buzz (caffeine) with 24 oz of water. I was able to refill my bottle with water easily at aid stations. Oiselle – Black Distance shorts, Wazelle short sleeve shirts, and team singlet. Trail Toes Cream – My go-to blister fighter. I slather this stuff on before I put my socks on to prevent hot spots. I also used it along my shorts waist band to prevent chaffing…works like a charm and is not just for your feet. Also doubles as a great chapstick since I forgot mine today. Salt Stick Caps – At mile 3 popped 2 tablets when I started to feel my legs cramp up a bit and then again every hour. I’m ready to rumble this winter and cannot wait to hit the snowy trails. I bought IceSpikes last year in preparation for epic adventures in 2017!! !